SeaWorld® Orlando is so much more than Shamu. This incredible amusement park in also boasts Aquatica, a state-of-the-art water park, and Discovery Cove, an all-inclusive resort that offers unprecedented opportunities to enjoy face-to-face encounters with some amazing sea creatures. If you’re a fan of roller coasters, the main SeaWorld® Orlando park has three thrilling coasters: MAKO®, Kraken Unleashed®, and Manta®. MAKO, which premiered in 2016, is called a “hypercoaster” and is the fastest and tallest ride in the Central Florida area. If you’d prefer a water ride to cool you off, Journey to Atlantis and the new river rapid ride Infinity Falls will leave you thrilled ― and soaked! Of course, most people are drawn to SeaWorld® Orlando for the variety of animals that call the park home. Opening just a few years ago, Antarctica: Empire of the Penguin is a peaceful ride that takes you through a live penguin exhibit. The ride ends in an open-air habitat that lets guests get surprisingly close to these cold-weather cuties. TurtleTrek gives you an up-close look at not only sea turtles but also alligators and manatees as well. As for shows, Shamu Stadium features killer whales that perform in the One Ocean® and Ocean Discovery presentations. Kids can laugh along with Clyde and Seamore’s Sea Lion High as well as the Pets Ahoy show. Everyone will enjoy watching bottlenose dolphins strut their stuff in the Dolphin Days show. All of the beautiful animals features in these rides, exhibits, and shows live in habitats nearby for you to take a closer look when they’re not on stage. 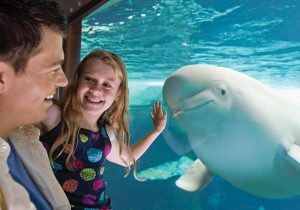 For amazing savings on cheap SeaWorld® Orlando discount tickets, some of the lowest prices on packages, hotels, and exclusive deals on travel, call 1 (800) 434-7894 (international callers use +1 (619) 546-5622) to speak with an aRes Travel planning expert seven days a week, or book online now.